Historic Center (Centro Historico) and Chapultepec Castle will appeal to history buffs. Satisfy your inner culture vulture at Metropolitan Cathedral (Catedral Metropolitana) and Zona Arqueologica Teotihuacan. Get out of town with these interesting Mexico City side-trips: Cuernavaca (Robert Brady Museum & Archaeological Zone of Xochicalco). And it doesn't end there: examine the collection at National Museum of Anthropology (Museo Nacional de Antropologia), get to know the fascinating history of Zocalo, get a sense of history and politics at National Palace (Palacio Nacional), and explore the world behind art at Palacio de Bellas Artes. To find photos, other places to visit, traveler tips, and more tourist information, use the Mexico City trip maker website . If you are flying in from Brazil, the closest major airports are Licenciado Benito Juarez International Airport, Querétaro Intercontinental Airport and General Francisco J. Mujica International Airport. 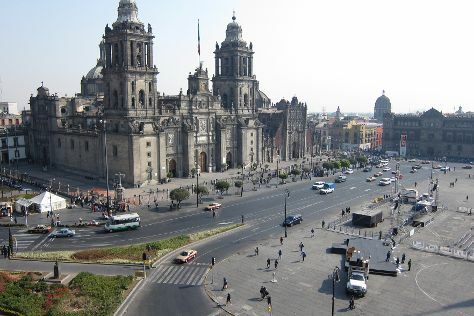 In May, daytime highs in Mexico City are 30°C, while nighttime lows are 16°C. Cap off your sightseeing on the 26th (Sat) early enough to travel back home.